The train jolted, smoke billowing into Flywheel’s face, as Georgo made a last minute swing at the junction lever. To their right, the Crimson Inferno roared along another of the tangled tracks that crossed the old warzone. 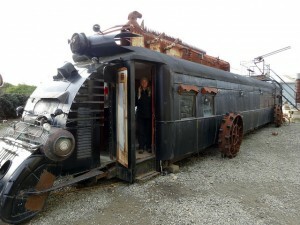 For a moment it vanished behind the armoured carcass of an artillery train. When it reappeared it was a dozen feet ahead of them and gaining. Georgo cursed as he surveyed the tracks, while Flywheel flung coal into the furnace, sweat pouring down her face. Tracks screeched by beneath their wheels, but as the trains drew toward another junction, the Crimson Inferno was a whole carriage length ahead. “Here!” She flung the shovel to Georgo and grabbed a wrench. Swinging at a signalling lever, she sent them careening onto a track set to merge with their opponents. They could hold their nerve and risk a crash, or they could starve. Across the dirt and rubble, she saw shock on the other driver’s face. Then determination took its place. Casting aside his wrench he picked up a shovel, forcing more speed from his screaming engine. There was one more junction before the tracks merged, one last chance to chicken out and avoid catastrophe. The Inferno rushed straight through. Flywheel swung at the junction switch with her wrench. The Silver Bolt turned onto a side track, any hope to catch up gone. Shaking her head, she watched the other train head down the straight line toward victory. With a screech of tearing metal, the straight track twisted and snapped beneath the Crimson Inferno. One end leapt up, twisting into the wheels and dragging the engine from the track.There was an almighty crash, then a crack like lightning and a woomph as super heated steam burst in a scalding cloud from the boiler. If you enjoyed this story, you can get more like it by signing up to my mailing list. 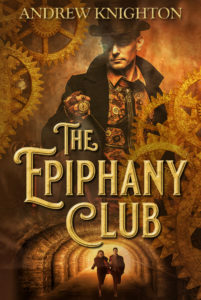 You’ll get a free copy of Riding the Mainspring, my collection of steampunk short stories, as well as free flash fiction straight to your inbox every Friday. If you find you don’t like it, you can unsubscribe any time you like at the push of a button.